Tarps Plus Blog: Slip N Slide Weekend With Poly Tarps!! 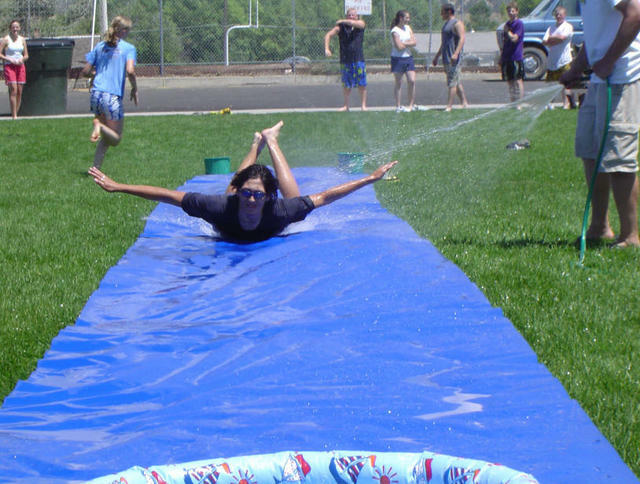 Slip N Slide Weekend With Poly Tarps!! Wow what wonderful weekends we are now having, nice and warm the perfect weather to start heading out to the pool, lake, rivers and just soak up in the sun. Now a days with the economy its not easy for everyone who doesn't have a pool at home to take off for the weekend and do some outdoor activities. What if Tarps Plus told you that you can have an amazing time at home maybe even while you take care of your errands and chores the children can be distracted, having fun and letting you relax? It's easy! a poly tarp can easily be converted as a slip in slide and with out having to spend $100 on a slip and slide you can pick up a few tarps at tarps plus and make your own slip and slide! check out all the tarps at www.Tarpsplus.com now and also save while the spring sale is going strong!!. This looks like so much fun! I'm gonna get a few and keep my children entertained so I can get some ME time. Great Idea you guys! I agree, this looks like tons of fun, I am also gonna grab a few. Tarps Can Be Used To Set Up Shade! Save Now On All Tarps! Get Your Pool Cover Now! Don't Get Caught Without a Backpacking Tarp! Tarps Plus Now Has The Toughest Tent Stakes!! Fire Retardant Tarps Sold here at Tarps Plus. Clear Tarps Are Sold Here at Tarps Plus. Every Trucker Needs One, A Truck Tarp!! The Time is Now To Save On Large Poly Tarps! BackPacking Tarps are Available Now! Tarps For The Camping Set Up!